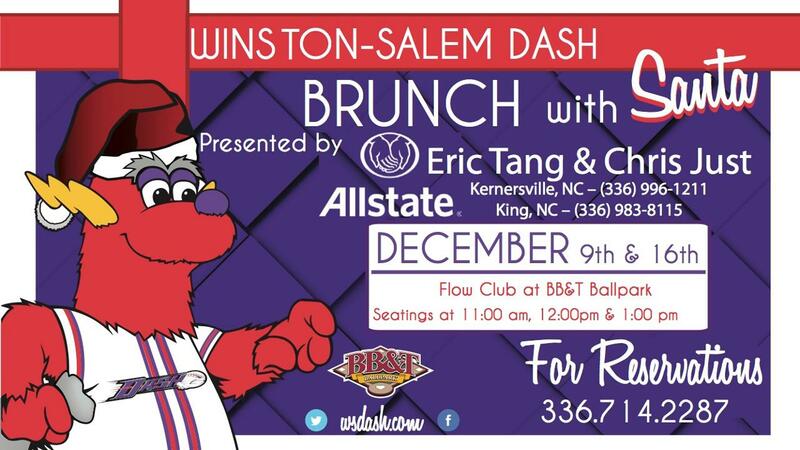 WINSTON-SALEM, N.C. (Nov. 20, 2018) - This holiday season, the Winston-Salem Dash will hold "Brunch with Santa", presented by Allstate agents Eric Tang and Chris Just on December 9 and December 16 with seatings at 11 a.m., 12 p.m. and 1 p.m. inside the Flow Club at BB&T Ballpark. All attendees will enjoy a brunch buffet that includes fried and baked chicken, roast beef, mashed potatoes, steamed vegetables, fresh fruit, a waffle station and much more. Santa Claus will be on hand and available for photos throughout the event. Bolt will make several appearances during the event, too. All of this is available for just $15.95 per person. This price includes all applicable taxes. Reservations must be made in advance, so call (336) 714-2287 to guarantee your seat.